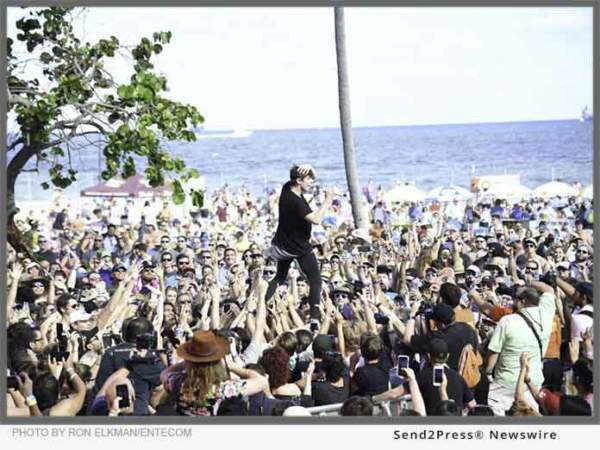 MIAMI, Fla., Dec 13, 2017 (SEND2PRESS NEWSWIRE) -- The Entercom Radio Miami produced Riptide Music Festival powered by Ford brought 37,000 people to Fort Lauderdale Beach to experience two-days of epic artists, amazing global cuisine and wine along with picture perfect weather that even included a supermoon! Riptide is produced by the staff of 104.3 The Shark, 102.7 The Beach, 101.5 LITE FM and 790 The Ticket. "This year's Riptide was a magical experience that even blew away our highest expectations," said Riptide Executive Producer & Entercom Marketing Director, Von Freeman. "To increase our audience attendance by 12,000 people in one year is truly a testament to the incredible performers that participated and the expanded experience we created for our patrons. We are excited to get planning our third Riptide!" Riptide drew rave reviews from guests and media for its sophomore year. The artist lineup was declared "epic" by multiple media outlets and each act seemed to step up to the challenge of excelling the other. Saturday brought out 25,000 alternative and indie rock fans to witness so many memorable performances including showstoppers from Andrew McMahon, PVRIS, Portugal the Man, Weezer and the cannot-stop-buzzing-about set by Cage the Elephant. Sunday's show had a relaxed all-ages party feel, as 12,000 sang out every word of their favorite songs and burst into spontaneous dance moves with the encouragement of acts like Morris Day and The Time, Salt-n-Pepa, Boyz II Men and KC and The Sunshine Band. "We are so thankful to all of our sponsors who make this a tremendously successful event," continued Freeman. "Their support and encouragement will help us grow Riptide into a long- standing festival that attracts music lovers from around the country to experience a diverse array of performers and the awesome Fort Lauderdale Beach!" Riptide partners include The Fort Lauderdale Beach BID, Greater Fort Lauderdale - Hello Sunny, Underground Music, South Florida Ford Dealers, The Law Offices of Anidjar & Levine, 1-800-747-FREE, Bahia Mar Fort Lauderdale Beach by Doubletree a Hilton Hotel, Wadka Vodka, One with Life Organic Tequila, Blue Chair Bay Rum, Gulf Stream Park, Shaw-ross wine, Rip it Energy drink, Goya Foods, Scales Gear, Kind Bars, Yuengling Beer, Catholic Health Services, B Ocean Resort and W Fort Lauderdale, Celebration of the Sea, #1000 Mermaids, Krave Jerky and Smeraldina Water. Entercom Communications Corp. (NYSE: ETM) is the fourth-largest radio broadcasting company in the United States, with a portfolio of 125 highly rated radio stations in 27 top markets across the country. Known for developing unique and highly successful locally programmed stations, Entercom's brands reach and engage close to 40 million people each week, delivering a curated mix of outstanding local personalities and a broad range of compelling music, news, talk and sports content. Founded in 1968, Philadelphia-based Entercom also operates hundreds of events each year attracting millions of attendees and provides customers with a broad range of digital marketing solutions through its SmartReach Digital products. More information is available at http://entercom.com/, Facebook and Twitter (@entercom). * Photo credit: Riptide Music Festival, photo by Ron Elkman/Entercom.